J.D. 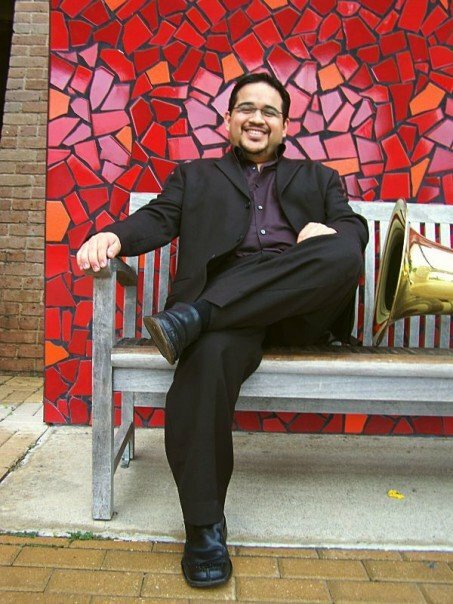 Salas, a native of Alamo, Texas (Rio Grande Valley), joined the faculty of Stephen F. Austin State University in the fall of 2006 where he serves as Associate Professor of Music in Tuba-Euphonium Studies and director of the 2nd jazz ensemble, The Swingin’ Aces. J.D. received his Bachelor of Music degree from Baylor University in Waco, TX where he studied with Dr. Michael A. Fischer and his Master of Music degree from the University of Kentucky in Lexington, KY. In 2011 he completed the Doctor of Musical Arts Degree at the University of Kentucky, where he served as the teaching assistant studying under Dr. Skip Gray. Prior to his appointment at SFA, Dr. Salas served as Artist/Instructor of Tuba & Euphonium Studies at Mahidol University in Bangkok, Thailand where he served as the country’s first full-time tuba-euphonium professor. Other previous teaching appointments include adjunct positions at Transylvania University in Lexington, KY where he taught low brass & jazz bass and Instructor of Tuba at Marshall University in Huntington, WV. Dr. Salas currently performs professionally as a member of The Four Horsemen Tuba-Euphonium Quartet and the Mix’n Matches Jazz Trio. He was a founding member of BrassArts Bangkok, one of the premier brass chamber ensembles in Thailand and performed one of the first solo tuba recitals in Vietnam at the Hanoi Conservatory of Music and at Mahidol University in Bangkok, Thailand in 2004. J.D. has regularly presents recital performances at the ITEA South Central Regional Conferences, and International Tuba-Euphonium Conferences. An accomplished string bass player in both the jazz and classical idioms, J.D. has performed with the Temple Symphony Orchestra, Disneyland All-American College Band in Anaheim, California, and the Disneyland Paris International Show Band in Paris, France where performed with many musical legends as Bobby Shew, Jiggs Wigham, and Ricky Ford. J.D. has also been a semi-finalist in many International tuba artist competitions such as the Falcone Tuba/Euphonium Artist Competition in 2002 & 2003 and the 2002 International Tuba-Euphonium Conference Artist Competition.